Since the end of Hard/Glam Metal in the beginning of the 90’s, many bands went on hiatus or even ended their careers, for the musical industry left them all to gain money from the Grunge Rock/Alternative Rock trend. And even bands with roots on the 70’s, on Classic Rock age, had to withdraw from the fight. But English quintet THUNDER was active during the 90’s, and after a hiatus between 2000 and 2002, they came back and are rolling the rocks since then. And now, they’re releasing this new album, “Please Remain Seated”. It’s a recollection of some old songs of the band, re-recorded now on acoustic versions. It fits on their main way, because the band, even having success in the end of Hard/Glam Metal era, was focused in playing a form of Classic Rock rooted on the 70’s, being names as STATUS QUO and LED ZEPPELIN the main reference, besides they have a touch from 80’s charming melodies. On this album we can see the same influences from Rock, Blues, Country, Jazz and Soul music. It’s deeper and introspective and sounds lovely and tender to the ears of the listeners. To such kind of music, a good sound production is needed, and “Please Remain Seated” shows it clearly: it’s truly clean and done in a way that their music sounds organic. The choice for the tunes was done in a way that we can understand each little musical arrangement, without the compromise to be aggressive or heavy. The Country/Southern Rock touch of “Bigger Than Both of Us”, the tender and charming melodies of “Future Train” (with a more introspective outfit and even female backing vocals can be heard), the charming Country ballad “I’m Dreaming Again”, the Folk Rock essence of “Fly On the Wall”, the “noir Jazz” aura of “Empty City” (the fans will feel like being into a smoky bar on late 50’s during the song), the Psychedelic elements of “Miracle Man”, and the melodic grasp of “She’s So Fine” will nail the fans in the places they are. Yes, it’s really a charming album. 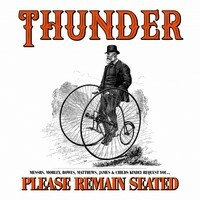 THUNDER did a great work on these new versions for old songs that are presented on “Please Remain Seated”, and it deserves many spins on the CD player. Listen to it and enjoy!